As the foliage bursts with vibrant colors, you know it’s time to relish the joys of pumpkin patches, apple orchards and corn mazes. 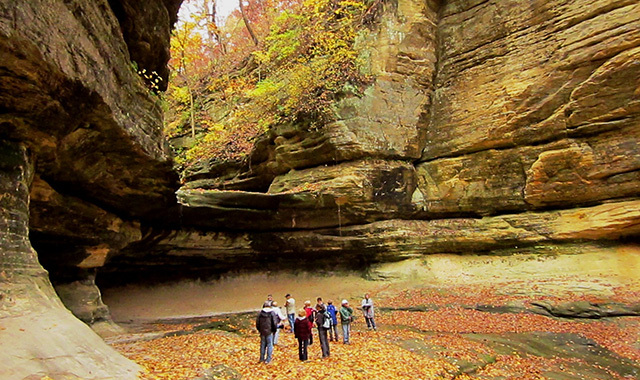 And that’s only a taste of what’s in store when venturing out and exploring the many attractions in DeKalb County. “The fall season is upon us, and we’re all about the great outdoors during this time of the year,” says Debbie Armstrong, executive director of DeKalb County Convention and Visitors Bureau. Take a step back and enjoy fun on the farm by choosing the perfect pumpkins, finding a tasty fresh apple, or partaking in cozy bonfires and spooky evening hayrides with the family. There are many orchards and farms in DeKalb County where you can try something new and make memories. What could be more fun than taking a selfie or a photo of the kids on a bale of straw or a tractor and wagon festooned with pumpkins of all sizes? Theis Farm in Maple Park offers an exciting time with a wide variety of pumpkins, gourds, squash, corn stalks and Indian corn. Bring back some homegrown popcorn to savor on those late fall and winter nights. Brighten up your outdoor decor with mums – available in all of your favorite colors. There’s a large selection every day, and there’s no admission or parking fee. 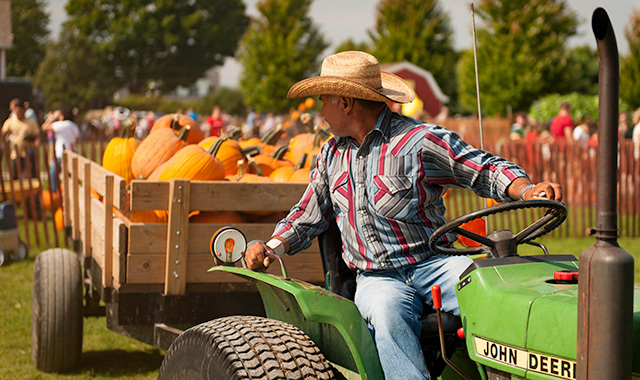 Johnson’s Pumpkin Stand and Corn Maze in Sycamore offers more than 50 varieties of pumpkins, gourds and squashes in a myriad of colors, shapes and sizes. Why not wander through Johnson’s corn maze, designed to this year’s theme of “Take Me Out to the Ballgame,” and hum along to the tune? Honey Hill Orchard in Waterman celebrates everything fall with apple cider, honey, caramel apples, and freshly baked apple cider donuts and pies. Make your choices within the cozy atmosphere of the 1880s converted Apple Barn, filled with these tempting choices and other crafts and gifts. There’s a farm petting zoo, plus a straw maze and weekend wagon rides. It’s also pick-your-own apple and pumpkin season at Honey Hill. Jonamac Orchard is a three-generational family farm in Malta that’s ready for a delicious season. The Cider House is the perfect place to sample apple wines and hard ciders. The usual favorite apple varieties are available, including Granny Smith, Jonagold and Red Delicious, but you can try something new like Suncrisp, Blushing Gold or Wine Crisp, too. Browse the bakery filled with specially made jams, jellies, mustards and Jonamac’s very own apple butter. Enjoy the corn maze and the barnyard with a kid-friendly play area, jumping pillow and petting zoo. How about a transition into the delicious world of libations? Spirits-related attractions include Forge Brewhouse Tap Room in DeKalb, The Forge of Sycamore, Jonamac Orchard Cider House in Malta, Prairie State Winery in Genoa and Sycamore, Waterman Winery in Waterman, and Whiskey Acres Distilling Company in DeKalb. These venues offer award-winning Illinois wines; craft beers and craft sodas; microbrews; and whiskey, bourbon and vodka. The wineries and distillery offer tours and tastings to enhance the experience. For more information on apple orchards, corn mazes and Bold Spirit locations, visit dekalbcountycvb.com. 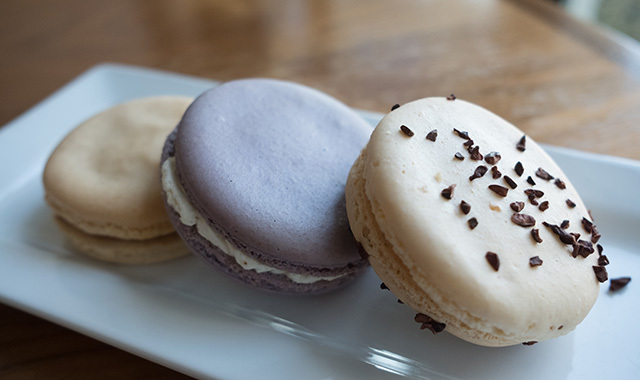 The oversized macarons at Grandview Restaurant are entirely house-made, as are all items in the bread basket. Af a quick day trip or weekend getaway is in the making this fall, a relaxing pace of life awaits at the Geneva Inn, located in Lake Geneva. Such qualities as panoramic lakeside views, charming accommodations, and world-class dining options are sure to create indelible memories that will linger far into the cold winter months. The Geneva Inn, situated on the scenic shores of Geneva Lake, provides a scenic perch for drinking in the view. Dine indoors in the acclaimed Grandview Restaurant or sit on the cozy patio a few feet away from the water. The Grandview Restaurant is a highly respected dining tradition. Visger comes to the Geneva Inn with a strong culinary background perfected over the years. He most recently taught culinary arts in Chicago and served as executive sous chef at the classical French patisserie Vanille Patiserrie. There he studied under Josh Johnson, an award-winning pastry chef. Chef Visger’s hands-on experience was also established in Denver, Colorado, where he worked at Bon Appetit as a sous chef and at Glaze, a Japanese bakery voted the best in Denver. Glaze is well-known for producing “Baumkuchen,” a traditional German variety of spit cake. It uses the only specialized oven in the U.S. to make this European dessert. Diners will savor menu selections expressing the appeal of farm-to-table local freshness. Breakfast and brunch choices include “The Local Omelet,” with heirloom tomatoes, spinach, roasted corn, roasted bell pepper and goat cheese, and “The Chorizo Benedict,” with two poached eggs, fried chorizo cake, arugula, red onions, pickled Granny Smith apples and cilantro pesto hollandaise. Lunch diners can savor house-made potato chips with burgers, traditional Cubano sandwiches, turkey avocado clubs and more. The wide dinner menu includes entrees like Fruita de mar (pasta with scallops and shrimp) and a New York Strip with Matri d’ butter. All bread basket items are house-made, as are the “grand macarons,” which are larger than the traditional favorite. The Supper Club Pre Fixe offers a three-course feast. Choose from a selected soup or salad; a main course of seafood platter, Berkshire pork chop, roasted half-chicken or veal picatta with choice of potato; and a finale third-course selection of apple pie tart or scoop of ice cream. Spirited beverage choices include the popular house-made Grandview Bloody Mary with a Spotted Cow Chaser. These standard favorites and new additions reflect Chef Visger’s belief in developing relationships with vendors and local farmers while respecting the entire process involved in bringing it to a guest’s plate. “I believe in preparation, hard work and efficiency, going above and beyond expectations to give our guests the best experience in every single meal,” he says. To find out more about the Grandview Restaurant’s menu and what’s new at the Geneva Inn, visit genevainn.com. Tribute to the Stars matinees continue this fall with a tribute to Elvis on Oct. 1-2, a Patsy Cline tribute on Oct. 2, and a World War II-era radio show, complete with a tribute to our veterans, on Nov. 12-14. This entry was posted on Monday, September 24th, 2018 at 11:59 am	and is filed under Recreation & Destinations. You can follow any responses to this entry through the RSS 2.0 feed. Both comments and pings are currently closed.